"Ganttic is an universal planning and scheduling tool helping to organize people, facilities, vehicles and any other kind of resources." Ganttic scored 82/100 in the Product Management category. This is based on user satisfaction (82/100), press buzz (39/100), recent user trends (rising), and other relevant information on Ganttic gathered from around the web. 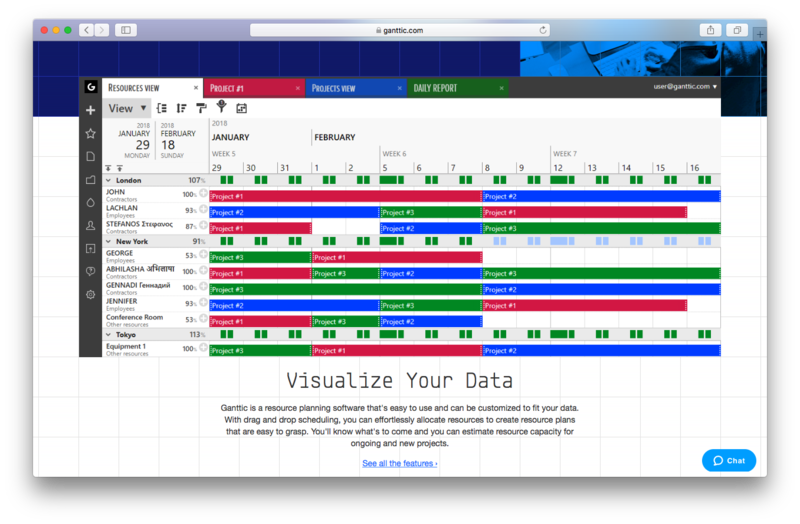 Ganttic is a customizable project management and visualization platform. It is designed with a user-friendly interface that utilizes color-coded tasks and assignments for easier navigation. It also focuses on reporting and helping generate interactive Gantt charts for in-depth data analysis. The software solution also provides streamlining for your company’s workforce with features like data archiving and scheduling capabilities. Ganttic focuses on making project management faster, simpler, and smarter. It has a color-coded dashboard that comprehensively tracks tasks set to different personnel and departments. It can be used to check each employee’s role in the overall company work plan, as well as also creating detailed reports with Gantt charts for performance reviews. Furthermore, the platform can customize certain appointments and meetings to include only concerned individuals. You can even filter the system to find the project, task, or person you need at any given time. Ganttic uses a calendar to let you know what you need. Some of its more intrinsic features setting tasks and projects according to a general set of information, or according to a specific set of instructions. Details such as the type of project, the people or departments involved, and progress tracking are just some of the items that can be adjusted. Other parameters can also be set that you need to track, such as the stage a task is in or related tasks. The calendar can be personalized to fit your environment. Time zones can be selected and applied. This can help teams from various time zones synchronize their work without having to collaborate on getting their time zones straightened out. A task-timing schedule can also be created. Simply input the start and end dates on tasks and projects, and it will monitor the number of days spent and the percentage of work focused on a specific project. Ganttic comes with a permission-based access system that can assign certain individuals with administrative powers. Admin staff can even filter some items on the calendar as private, ensuring items like performance evaluations and lay-off discussions can be kept hidden from the team members in question. Aside from the actual tasks, Ganttic can help manage an entire workforce. It provides have access to different users and their data, such as position in the company, access level, or user rights and the capacity to change their password. This can help securely monitor your team, and efficiently deal with users that either get promoted or terminated. Since this is also a collaborative tool, Ganttic also lets you set an employee’s work hours in the day. It can even set how many personnel are needed for one task. This is useful in planning who can work on a certain task and what shifts are available for appointments, calls, or meetings. This can also be of help if your business requires night-shift workers. Ganttic can also include manpower monitoring elements on calendar items and the respective user profile of your employee. These include hourly rates, statuses, and requirements. If you want to manage the workload of each employee, Ganttic also has a capacity utilization tool that can help avoid the overloading of an individual with tasks. Once a task is assigned, the software solution connects this task to the other tasks assigned to that specific employee. When scrolled over, you can see how much of their time their tasks are consuming. If it surpasses 100%, it means the employee is overloaded. To help detect these instances, you can assign color codes to indicate how much effort they are using. If you want to avoid overloading employees, you can have them multitask instead. If the employee is able to take on additional work, you can add tasks that are of a less urgent priority to their docket. These can be arranged according to priority to help employees better manage their work. Resources, whether they are tools, materials, or employees, are vital to completing different tasks. The dashboard provides monitoring of all of your resources in the company to see how each one is used and what it’s used for. You can check them according to different types and departments, to make it easier to track various resources in the list. Tasks that require more than one resource or user can be grouped together. This can be due to each resource being in different locations or the fact that several people are needed for the completion of a task. You can assign each one based on what department they work in or where their office is based. Furthermore, a color code can be assigned to them to inform the rest of your company which task is assigned to which group. 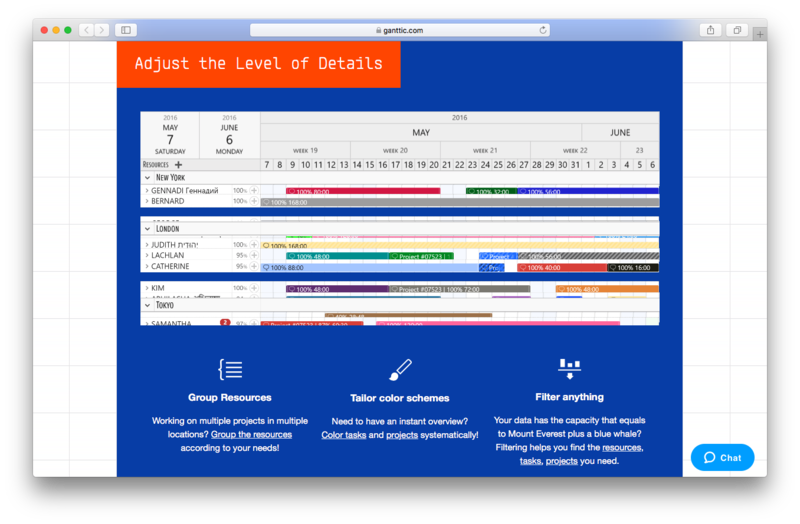 Regarding color, you can plan and customize the color scheme of the entire interface. This helps in finding the right group or task in your dashboard and in making it easier to differentiate them visually. Conditions can also be set for different colors, such as when a task is falling behind schedule or if an employee is overloaded. You can do this to highlight which projects are prioritized first, or if they are assigned to the same person. If you need to search for the right person or task and looking for them is challenging, a filter can be used to sort through your resources. Searches can be conducted according to department, urgency, or through tags. Multiple filters can be added simultaneously if you need to search for a specific resource or project. Data reporting is vital to your company because it helps monitor the overall performance and success of your projects. Ganttic provides Gantt chart reports that can be set up to give an overview of the tasks, resources used, and even an overview of a project’s progress. It can also specify the type of report you will be generating. Some examples are task-driven reports that display data on the tasks completed within a set of given parameters. You can also set up resource-driven reports that present the data on the resources a project is using. Lastly, you can set up project-driven reports—these give an overview of the tasks and resources used in a given project. Following the completion of the reports, you can either save them to the archive or have them converted to PDF or CSV formats, which can easily be sent out to key personnel or even printed out for public distribution. You can also automatically generate reports on a daily, weekly, monthly, or yearly basis. The true worth of Ganttic lies in its ability to consolidate various data into a simple, color-coded, and simplified interface. This makes it easier to check the status of projects at a glance. It can even be set up in such a way that the data is presented in a manner familiar to you and your team. This makes it easier to generate reports that are easy to interpret and provide the most information about your projects. A key feature of the solution is the task management and connection system. This function offers the ability to track exactly what your team is working on, especially regarding who’s overloaded and who isn’t. You can also check on interconnected tasks, which can be great if you need to understand what tasks are necessary to complete a specific step in a given project. Ganttic comes with a free trial upon request. The free trial lasts 14 days. If you choose to buy the product, you can avail of various tier packages with different prices. The tiers range from 20 to 1,000 resources per month, with a corresponding price per resource. The price gets more cost efficient the more resources you need in a month, but if you only need a few resources in a given span of time, then the more expensive plans might not necessarily be what you need. 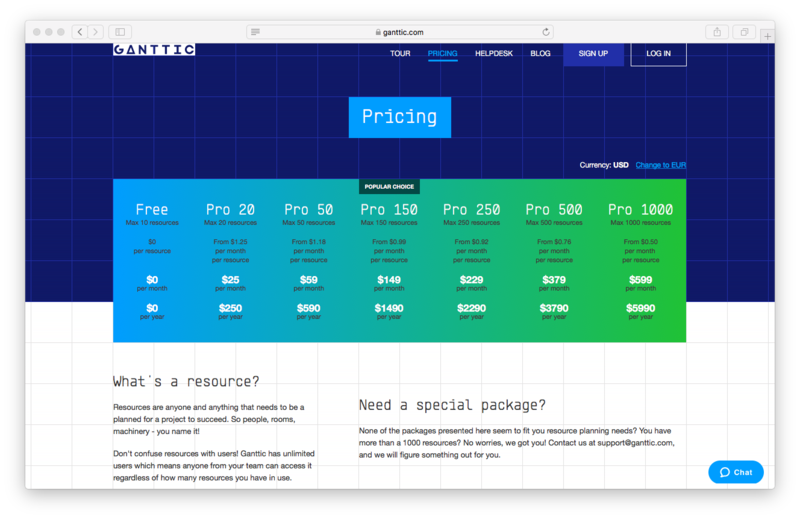 The free version of Ganttic lets you use 10 resources a month. This can be useful for startup and small-scale companies with minimal resources. The first paid tier limits your resource usage from 20 to 150, which can be useful for small and medium companies. For larger companies and enterprises, there are editions that let you include anywhere from 250 to 1000 resources. If you require more than 1000, you will have to get in touch with Ganttic for a custom quote. Overall, Ganttic is a good project management and scheduling program that’s very much customizable. It has several features including task assignment, deadline scheduling, and Gantt chart reporting. Its standout features are progress tracking, task connections, and time zone settings. The platform has resource-based pricing which is beneficial for businesses of all sizes. This software solution is recommended if your company wants a smooth planning system with easy visuals and the flexibility to handle a varying amount of resources. Product recommendations, vendor rankings, market overview and tips on how to select Product Management software for business. Published in April 2019. Does Ganttic offer an API? Does Ganttic offer guides, tutorials and or customer support? Does Ganttic offer multi-user capability (e.g. teams)? Does Ganttic integrate with any other apps? What is Ganttic generally used for? What platforms does Ganttic support? Who are the main user groups of Ganttic?